Since the introduction of Bitcoin in 2008, blockchains have gone from a niche cryptographic novelty to a household name. Ethereum expanded the applicability of such technologies, beyond managing monetary value, to general computing with smart contracts. However, we have so far only scratched the surface of what can be done with such “Distributed Ledgers”. The EU Horizon 2020 DECODE project aims to expand those technologies to support local economy initiatives, direct democracy, and decentralization of services, such as social networking, sharing economy, and discursive and participatory platforms. Today, these tend to be highly centralized in their architecture. There is a fundamental contradiction between how modern services harness the work and resources of millions of users, and how they are technically implemented. The promise of the sharing economy is to coordinate people who want to provide resources with people who want to use them, for instance spare rooms in the case of Airbnb; rides in the case of Uber; spare couches of in the case of couchsurfing; and social interactions in the case of Facebook. These services appear to be provided in a peer-to-peer, and disintermediated fashion. And, to some extent, they are less mediated at the application level thanks to their online nature. However, the technical underpinnings of those services are based on the extreme opposite design philosophy: all users technically mediate their interactions through a very centralized service, hosted on private data centres. The big internet service companies leverage their centralized position to extract value out of user or providers of services – becoming de facto monopolies in many case. When it comes to privacy and security properties, those centralized services force users to trust them absolutely, and offer little on the way of transparency to even allow users to monitor the service practices to ground that trust. A recent example illustrating this problem was Uber, the ride sharing service, providing a different view to drivers and riders about the fare that was being paid for a ride – forcing drivers to compare what they receive with what riders pay to ensure they were getting a fair deal. Since Uber, like many other services, operate in a non-transparent manner, its functioning depends on users absolute to ensure fairness. The lack of user control and transparency of modern online services goes beyond monetary and economic concerns. Recently, the Guardian has published the guidelines used by Facebook to moderate abusive or illegal user postings. While, moderation has a necessary social function, the exact boundaries of what constitutes abuse came into question: some forms of harms to children or holocaust denial were ignored, while material of artistic or political value has been suppressed. Even more worryingly, the opaque algorithms being used to promote and propagate posts have been associated with creating a filter bubble effect, influencing elections, and dark adverts, only visible to particular users, are able to flout standards of fair political advertising. It is a fact of the 21st century that a key facet of the discursive process of democracy will take place on online social platforms. However, their centralized, opaque and advertising-driven form is incompatible with their function as a tool for democracy. Finally, the revelations of Edward Snowden relating to mass surveillance, also illustrate how the technical centralization of services erodes privacy at an unprecedented scale. The NSA PRISM program coerced internet services to provide access to data on their services under a FISA warrant, not protecting the civil liberties of non-American persons. At the same time, the UPSTREAM program collected bulk information between data centres making all economic, social and political activities taking place on those services transparent to US authorities. While users struggle to understand how those services operate, governments (often foreign) have total visibility. This is a complete inversion of the principles of liberal democracy, where usually we would expect citizens to have their privacy protected, while those in position of authority and power are expected to be accountable. The problems of accountability, transparency and privacy are social, but are also based on the fundamental centralized architecture underpinning those services. To address them, the DECODE project brings together technical, legal, social experts from academia, alongside partners from local government and industry. Together they are tasked to develop architectures that are compatible with the social values of transparency, user and community control, and privacy. The role of UCL Computer Science, as a partner, is to provide technical options into two key technical areas: (1) the scalability of secure decentralized distributed ledgers that can support millions or billions of users while providing high-integrity and transparency to operations; (2) mechanisms for protecting user privacy despite the decentralized and transparent infrastructure. The latter may seem like an oxymoron: how can transparency and privacy be reconciled? However, thanks to advances in modern cryptography, it is possible to ensure that operations were correctly performed on a ledger, without divulging private user data – a family of techniques known as zero-knowledge. I am particularly proud of the UCL team we have put together that is associated with this project, and strengthens considerably our existing expertise in distributed ledgers. I will be leading and coordinating the work. I have a long standing interest, and track record, in privacy enhancing technologies and peer-to-peer computing, as well as scalable distributed ledgers – such as the RSCoin currency proposal. Shehar Bano, an expert on systems and networking, has joined us as a post-doctoral researcher after completing her thesis at Cambridge. Alberto Sonnino will be doing his thesis on distributed ledgers and privacy, as well as hardware and IoT applications related to ledgers, after completing his MSc in Information Security at UCL last year. Mustafa Al-Bassam, is also associated with the project and works on high-integrity and scalable ledger technologies, after completing his degree at Kings College London – he is funded by the Turing Institute to work on such technologies. Those join our wider team of UCL CS faculty, with research interests in distributed ledgers, including Sarah Meiklejohn, Nicolas Courtois and Tomaso Aste and their respective teams. This post also appears on the DECODE project blog. After years in which discussions focused entirely on Bitcoin, people began to realize the more abstract potential of the blockchain, and “next-generation” platforms such as Ethereum, Steem, and Zcash were launched. More established companies also realized the value in the more abstract properties of the blockchain — resilience, integrity, etc. — and repurposed it for their particular industries to create an even wider class of technologies called distributed ledgers, and to form industrial consortia such as R3 and Hyperledger. These more general distributed ledgers can look, to varying degrees, quite unlike blockchains, and have a somewhat clearer (or at least different) path to adoption given their association with established partners in industry. Amidst many unknowns, what is increasingly clear is that, even if they might not end up quite like “the Internet,” distributed ledgers — in one form or another — are here to stay. Nevertheless, a long path remains from where we are now to widespread adoption and there are many important decisions to be made that will affect the security and usability of any final product. In what follows, we present the top ten obstacles along this path, and highlight in some cases both the problem and what we as a community can do (and have been doing) to address them. By necessity, many interesting aspects of distributed ledgers, both in terms of problems and solutions, have been omitted, and the focus is largely technical in nature. 10. Usability: why use distributed ledgers? The problem, in short. What do end users actually want from distributed ledgers, if anything? In other words, distributed ledgers are being discussed as the solution to problems in many industries, but what is it that the full public verifiability (or accountability, immutability, etc.) of distributed ledgers really maps to in terms of what end users want? 9. Governance: who makes the rules? In this process of making the rules, even the most decentralized networks turn out to be heavily centralized, as recent issues in cryptocurrency governance demonstrate. These increasingly common collapses threaten to harm the value of these cryptocurrencies, and reveal the issues associated with ad-hoc forms of governance. Thus, the problem is not just that we don’t know how to govern these technologies, but that — somewhat ironically — we need more transparency around how these structures operate and who is responsible for which aspects of governance. 8. Meaningful comparisons: which is better? The problem. Bitcoin was the first cryptocurrency to be based on the architecture we now refer to as the blockchain, but it certainly isn’t the last; there are now thousands of alternative cryptocurrencies out there, each with its own unique selling point. Ethereum offers a more expressive scripting language and maintains state, Litecoin allows for faster block creation than Bitcoin, and each new ICO (Initial Coin Offering) promises a shiny feature of its own. Looking beyond blockchains, there are numerous proposals for cryptocurrencies based on consensus protocols other than proof-of-work and proposals in non-currency-related settings, such as Certificate Transparency, R3 Corda, and Hyperledger Fabric, that still fit under the broad umbrella of distributed ledgers. 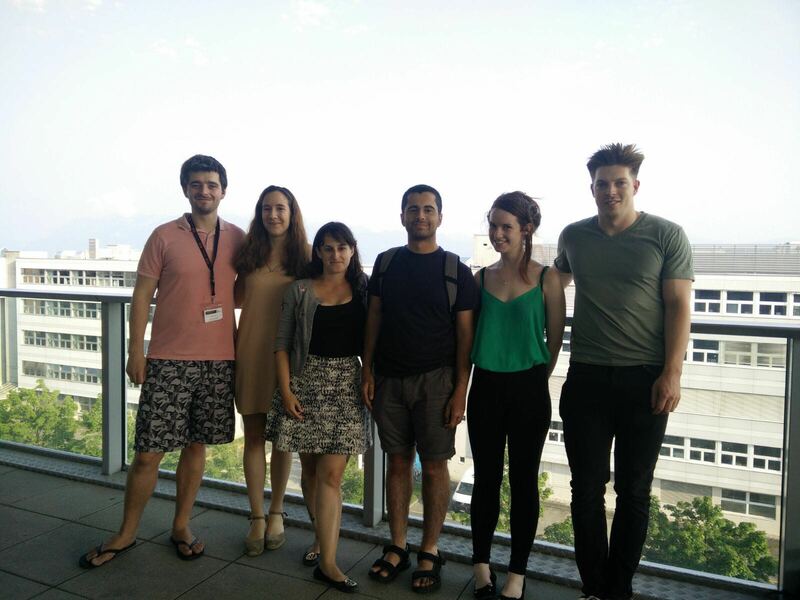 This year EPFL hosted a Blockchain Summer School from the 21st to the 24th of June. 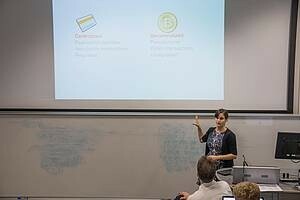 UCL was well represented with Sarah Meiklejohn presenting two talks whilst Sarah Azouvi, Patrick McCorry, Mustafa Al-Bassam and Alexander Hicks also attended. This blog post is a joint effort from the four of us, aimed at highlighting the talks presented last week. The Summer School featured talks on several aspects of blockchain technology ranging from classical distributed computing, security of smart contracts in Ethereum and proving the security of proof of work/stake. Here, we will provide a small summary for each of the talks. Slides can be found by clicking on each talk on the school’s program page. TLS-N: Non-repudiation over TLS Enabling Ubiquitous Content Signing for Disintermediation by Arthur Gervais: Gervais’ talk highlights that a slight modification to TLS can allow a smart contract to verify the authenticity of data received from website. Essentially, at the end of the TLS session the server signs evidence of the TLS session if requested by the client. This evidence is verified and stored by the smart contract. It is also worth mentioning that the protocol relies on redactable signatures that ensures private data isn’t revealed. Town Crier: An Authenticated Data Feed for Smart Contracts – Ari Juels: Juel’s talk highlights that trusted execution environments can be leveraged to build authenticated data feeds. This trusted hardware communicates with the website before sending the data to the smart contract. It is responsible for setting up a HTTPS session and fetching data from a website before sending the data to the smart contract. TownCrier is currently implemented using Intel SGX and is currently released for testing. This is one of the reasons why cryptography and smart contracts are a great combination. The contract can ensure the cryptography is faithfully executed, whereas the cryptography can provide integrity and confidentiality for data used by the contract. The introduction of ZCash, and subsequent articles explaining the technology, brought (slightly more) mainstream attention to a situation that people interested in blockchain technology have been aware of for quite a while: Bitcoin doesn’t provide users with a lot of anonymity. Bitcoin instead provides a property referred to as pseudonymity (derived from pseudonym, meaning ‘false name’). Spending and receiving bitcoin can be done without transacting parties ever learning each other’s off-chain (real world) identities. Users have a private key with which to spend their funds, a public key so that they can receive funds, and an address where the funds are stored, on the blockchain. However, even if addresses are frequently changed, very revealing analysis can be performed on the information stored in the blockchain, as all transactions are stored in the clear. For example, imagine if you worked at a small company and you were all paid in bitcoin – based on your other purchases, your colleagues could have a very easy time linking your on-chain addresses to you. This is more revealing than using a bank account, and we want cryptocurrencies to offer better properties than bank accounts in every way. Higher speed, lower cost and greater privacy of transfers are all essential. ZCash is a whole different ball game. Instead of sending transactions in the clear, with the transaction value and sender and recipient address stored on the blockchain for all to see, ZCash transactions instead produce a zero-knowledge proof that the sender owns an amount of ZEC greater than or equal to the amount that they are trying to spend. Put more simply, you can submit a proof that you have formed a transaction properly, rather than submitting the actual transaction to be stored forever on the blockchain. 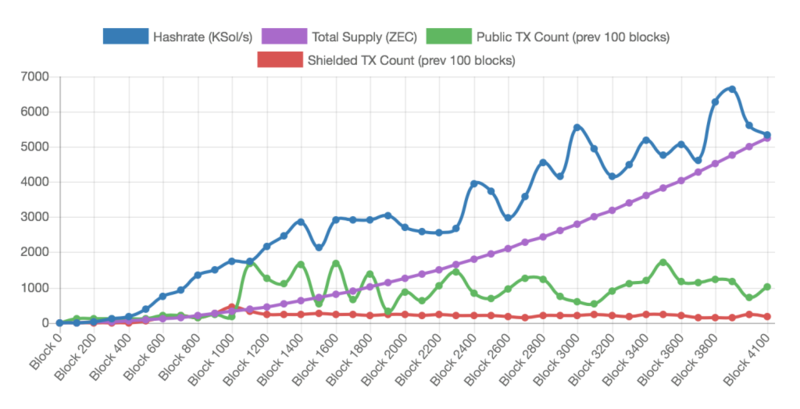 These proofs take around 40 seconds to generate, and the current supply of ZCash is a very limited 7977 ZEC. So I’m going to take you through some privacy enhancing methods that work on top of Ethereum, a cryptocurrency with approximately 15 second blocktimes and a current market cap of nearly $1 billion. If we do everything right, our anonymous transactions might even be mined before the ZCash proof has even finished generating. Currently 229/(7748+229)=2.87% of ZEC is stored in ‘shielded’ accounts, the rest (97.13%) is in a state with Bitcoin-like privacy properties. Stats and graph: Zchain. If a lot of the words above meant nothing to you, here’s a blockchain/Bitcoin/Ethereum/smart contract primer. If you already have your blockchain basics down, feel free to skip to part 2. Satoshi Nakamoto introduced the world to the proof-of-work blockchain, through the release of the bitcoin whitepaper in 2008, allowing users and interested parties to consider for the first time a trustless system, with which it is possible to securely transfer money to untrusted and unknown recipients. Since its launch, the success of bitcoin has motivated the creation of many other cryptocurrencies, both those built upon Bitcoin’s underlying structure, and those built entirely independently. Transactions in bitcoin are generally simple transfers of tokens from one account to another, and are stored in a block in the clear, with transaction value, sender, and recipient all available for any curious individual to view, analyse, or otherwise trace. The blockchain has a consensus algorithm. This is essential for construction of one agreed-upon set of transactions, rather than multiple never-converging views of who currently owns which bitcoins. To really understand how the privacy enhancing protocol conceived and implemented during my Master’s thesis works, we need to go a little deeper into the inner workings of a blockchain platform called Ethereum. In response to the limitations of Bitcoin’s restricted scripting language (you can pretty much only transfer money from A to B with Bitcoin, for security reasons), the Ethereum platform was created, offering an (almost) Turing-complete distributed virtual machine atop the Ethereum blockchain, along with a currency called Ether. The increased scripting ability of the system enables developers to create ‘smart contracts’ on the blockchain, programs with rich functionality and the ability to operate on the blockchain state. The blockchain state records current ownership of money and of the local, persistent storage offered by Ethereum. Smart contracts are limited only by the amount of gas they consume. Gas is a sub-currency of the Ethereum system, existing to impose a limit on the amount of computational time an individual contract can use. The arrows along the top show how to produce each piece of data from the previous. The labels on the bottom arrows are ‘known hard problems’, which cannot feasibly be solved with today’s computing power. Ethereum accounts take one of two forms – either they are ‘externally owned’ accounts, controlled with a private key (like all accounts in the bitcoin system), or ‘contracts’, controlled by the code that resides in the specific address in question. Contracts have immutable code stored at the contract address, and additional storage which can be read from and written to by the contract. An Ethereum transaction contains the destination address, optional data, the gas limit, the sequence number and signature authorising the transaction. If the destination address corresponds to a contract, the contract code is then executed, subject to the gas limit as specified in the transaction, which is used to allow a certain number of computational steps before halting. The ability to form smart contracts suggests some quite specific methods of addressing the lack of privacy and corresponding potential lack of fungibility of coins in the Ethereum system. Although cryptocurrencies provide some privacy with the absence of identity related checks required to buy, mine, or spend coins, the full transaction history is public, enabling any motivated individual to track and link users’ purchases. This concept heavily decreases the fungibility of cryptocurrencies, allowing very revealing taint analysis of coins to be performed, and leading to suggestions of blacklisting coins which were once flagged as stolen. Why have Bitcoin, with its distributed consistent ledger, and now Ethereum with its support for fully fledged “smart contracts,” captured the imagination of so many people, both within and beyond the tech industry? The promise to replace obscure stores of information and arcane contract rules – with their inefficient, ambiguous, and primitive human interpretations – with publicly visible decentralized ledgers reflects the growing technological zeitgeist in their guarantee that all participants would know and be able to foresee the consequences of both their own actions and the actions of all others. The precise specification of contracts as code, with clauses automatically executed depending on certain sets of events and permissible user actions, represents for some a true state of utopia. Regardless of one’s views on the potential for distributed ledgers, one of the most notable innovations that smart contracts have enabled thus far is the idea of a DAO (Decentralized Autonomous Organization), which is a specific type of investment contract, by which members individually contribute value that then gets collectively invested under some governance model. In truly transparent fashion, the details of this governance model, including who can vote and how many votes are required for a successful proposal, are all encoded in a smart contract that is published (and thus globally visible) on the distributed ledger. Today, this vision met a serious stumbling block: a “bug” in the contract of the first majorly successful DAO (which broke records by raising 11 million ether, the equivalent of 150 million USD, in its first two weeks of operation) allowed third parties to start draining its funds, and to eventually make off with 4% of all ether. The immediate response of the Ethereum and DAO community was to suspend activity – seemingly an anathema for a ledger designed to provide high resiliency and availability – and propose two potential solutions: a “soft-fork” that would impose additional rules on miners in order to exclude all future transactions that try to use the stolen ether, or, more drastically (and running directly contrary to the immutability of the ledger), a “hard-fork” that would roll back the transactions in which the attack took place, in addition to the many legitimate transactions that took place concurrently. Interestingly, a variant of the bug that enabled the hack was known to and dismissed by the creators of the DAO (and the wider Ethereum community). While some may be surprised by this series of events, Maurice Wilkes, designer of the EDSAC, one of the first computers, reflected that “[…] the realization came over me with full force that a good part of the remainder of my life was going to be spent in finding errors in my own programs.” It is not the case that because a program is precisely defined it is easy to foresee what it will do once executed on its own under the control of users. In fact, Rice’s theorem explicitly states that it is not possible in general to show that the result of programs, and thus smart contracts, will have any specific non-trivial property. This forms the basis on which modern verification techniques operate: they try to define subsets of programs for which it is possible to prove some properties (e.g., through typing), or attempt to prove properties in a post-hoc way (e.g., through verification), but under the understanding that they may fail in general. There is thus no scientific basis on which one can assert generally that smart contracts can easily provide clarity into and foresight of their consequences. The unfolding story of the DAO and its consequences for the Ethereum community offers two interesting insights. First, as a sign that the field is maturing, there is an explicit call for understanding the computational space of safe contracts, and contracts with foreseeable consequences. Second, it suggests the need for smart contracts protecting significant assets to include external, possibly social, mechanisms in order to unlock significant value transfers. The willingness of exchanges to suspend trading and of the Ethereum developers to suggest a hard-fork is a last-resort example of such a social mechanism. Thus, politics – the discipline of collective management – reasserts itself as having primacy over human affairs. I’m very pleased to announce that — along with George Danezis and Tomaso Aste, head of our Financial Computing group — I’ve been awarded a grant to continue our work on distributed ledgers (aka “blockchain-like things”) for the next three years. Our group has already done a lot of research in this space, including George’s and my recent paper on centrally banked cryptocurrencies (at NDSS 2016) and Jens’ paper (along with Markulf Kohlweiss, a frequent UCL collaborator) on efficient ring signatures and applications to Zerocoin-style cryptocurrencies (at Eurocrypt 2015). It’s great to have this opportunity to further investigate the challenges in this space and develop our vision for the future of these technologies, so big thanks to the EPSRC! Identity management. How can identities be stored, shared, and issued in a way that preserves privacy, prevents theft and fraud, and allows for informal forms of identity in places where no formal ones exist? Supply chain transparency. How can supply chain information be stored in a way that proves integrity, preserves the privacy of individual actors, and can be presented to the end customer in a productive way? Financial settlement. How can banking information be stored in a way that allows banks to easily perform gross settlement, reduces the burden on a central bank, and enables auditability of the proper functioning of the system? Administration of benefits. How can benefits be administered to and used by disadvantaged populations in a way that preserves privacy, provides useful visibility into their spending, and protects against potential abuses of the system? We expect the postdoctoral researchers to work with us and with each other on the many exciting problems in this space, which are spread across cryptography, computer and network security, behavioural economics, distributed systems, usable security, human-computer interaction, and software engineering (just to name a few!). I encourage anyone interested to reach out to me (Sarah) to discuss this further, whether or not they’ve already done research on the particular topic of distributed ledgers. That’s all for now, but please get in touch with me if you have any questions, and in the years to come I hope to invite many people to come work with us in London and to announce the various outcomes of this exciting project! Posted on 2016-04-21 2017-07-04 Author Sarah MeiklejohnCategories Blockchain, Cryptocurrencies, Cryptography, InfoSec group, Privacy, Research projects, Security usabilityLeave a comment on Come work with us! On 26 February 2016 the 3rd workshop on Bitcoin and Blockchain Research in association with Financial Cryptography 2016 took place in Barbados. This workshop aims to bring together researchers interested in cryptocurrencies to present their latest work and discuss together the future of Bitcoin. The program chairs were Sarah Meiklejohn from University College London and Jeremy Clark from Concordia University. The themes addressed during the workshop included blockchain architecture, anonymity, and proof of work alternatives. This event was also a great way for researchers with similar interests to network and share their ideas. The workshop consisted of 2 keynotes and 4 plenary sessions: Bitcoin network analysis, Enhancing Bitcoin, Ethereum, and Blockchain Architecture. Nathaniel Popper kicked off the day with a keynote presentation. Nathaniel is a journalist from the New York Times and author of the book ‘Digital Gold: The Untold story of Bitcoin’. He went on to speak about the history of Bitcoin covering Silk Road, Mt Gox, as well as the role of governments. Then the first session, about Bitcoin network analysis, included two talks. The first one, Stressing Out: Bitcoin Stress Testing, by Khaled Baqer et al., was about DoS attack on Bitcoin, and was presented by Ross Anderson due to visa issues. The second one was Why buy when you can rent? Bribery attacks on Bitcoin-style consensus, by Joseph Bonneau on bribery attacks and cloud mining. The next session, Enhancing Bitcoin, started with a talk by Ethan Heilman, Blindly Signed Contracts: Anonymous On-Blockchain and Off-Blockchain Bitcoin Transactions, on how to enhance Bitcoin anonymity. Then Mathieu Turuani gave a talk on Automated Verification of Electrum wallet, followed by Aggelos Kiayias on Proof of Proof of Work. Today many light-weight clients use SPV verification instead of full verification. Is it possible to have an even lighter verification? They introduce a modification of the Bitcoin blockchain protocol with sublinear complexity in the length of the chain. The UK Government Office for Science, has published its report on “Distributed ledger technology: beyond block chain” to which UCL’s Sarah Meiklejohn, Angela Sasse and myself (George Danezis) contributed parts of the security and privacy material. The review, looks largely at economic, innovation and social aspects of these technologies. Our part discusses potential threats to ledgers, as well as opportunities to build robust security systems using ledgers (Certificate Transparency & CONIKS), and overcome privacy challenges, including a mention of the z.cash technology. You can listen to the podcast interview Sarah gave on the report’s use cases, recommendations, but also more broadly future research directions for distributed ledgers, such as better privacy protection. In terms of recommendation, I personally welcome the call for the Government Digital Services, and other innovation bodies to building capacity around distributed ledger technologies. The call for more research for efficient and secure ledgers (and the specific mention of cryptography research) is also a good idea, and an obvious need. When it comes to the specific security and privacy recommendation, it simply calls for standards to be established and followed. Sadly this is mildly vague: a standards based approach to designing secure and privacy-friendly systems has not led to major successes. Instead openness in the design, a clear focus on key end-to-end security properties, and the involvement of a wide community of experts might be more productive (and less susceptible to subversion). The report is well timed: our paper on “Centrally Banked Crypto-Currencies” will be presented in February at a leading security conference, NDSS 2016, by Sarah Meiklejohn, largely inspired by the research agenda published by the Bank of England. It provides some answers to the problems of scalability and eco-friendliness of current proof-of-work based ledger design. As a child, Sarah Meiklejohn thought she might become a linguist, largely because she was so strongly interested in the work being done to decode the ancient Greek writing systems Linear A and Linear B. “I loved all that stuff,” she says. “And then I started doing mathematics.” At that point, with the help of Simon Singh’s The Code Book, she realised the attraction was codebreaking rather than human languages themselves. Simultaneously, security and privacy were increasingly in the spotlight. It was during her undergraduate years at Brown, which included a fifth-year Masters degree, that she made the transition from mathematics to cryptography and began studying computer science. She went on to do her PhD at the University of California at San Diego. Her appointment at UCL, which is shared between the Department of Computer Science and the Department of Crime Science, is her first job. Probably her best-known work is A Fistful of Bitcoins: Characterizing Payments Among Men with No Names (PDF), written with Marjori Pomarole, Grant Jordan, Kirill Levchenko, Damon McCoy, Geoffrey M. Voelker, and Stefan Savage and presented at USENIX 2013, which studied the question of how much anonymity bitcoin really provides. “The main thing I was trying to focus on in that paper is what bitcoin is used for,” she says. The work began with buying some bitcoin (in 2012, at about £3 each), and performing some transactions with them over a period of months. Using the data collected this way allowed her to uncover some “ground truth” data.